Today is actually Thanksgiving part two at our house. We will be going up to DH's grandparent's house for a Thanksgiving "leftovers" (I'm telling you, they make them fresh no mater how much they deny it!) It's a tradition. The whole extended family comes and we help Grandma and Grandpa decorate for Christmas. Did you Hip Hop on Wednesday? I did! It was super fun! I'm glad we didn't just skip it this week since it's normally on Thursday. Lots of fun, games, prizes, and chatting with some of my very favorite people. I love it! REFER JUST ONE Friend!!!!! FREE SINGLE - ANY SINGLE of your CHOICE!!!!!! Here is a little deal I am working up. We are going to make it simple to start. In the SUBJECT LINE please have your friend write YOUR NAME. In the EMAIL they should include their ORDER NUMBER and the word BEAUTY, BLOSSOM or SHINE and we will include a small stamp for them as well. ONE FRIEND. Referred to Unity. It will help us grow! THANK YOU SO MUCH! So, if you want to take advantage of Angela's AWESOME 20% off Black Friday sale and you haven't ordered Unity before, just drop Eryn and email and we'll BOTH get a free stamp! Tell them that Ashley Newell sent you over! Alright, I'm gonna go exercise or something so that I can eat yet another wonderful Thanksgiving meal in a couple hours. I hope you all have a fabulous weekend and if you are brave enough to shop today, a wonderful Black Friday! Cute cards, and great deals! I'm headed over right now to fill my cart! 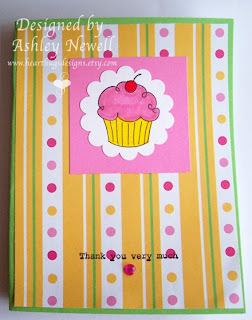 Love the cupcake card! It sounds like you have a wonderful day planned with family...what a great tradition. Great cards!! 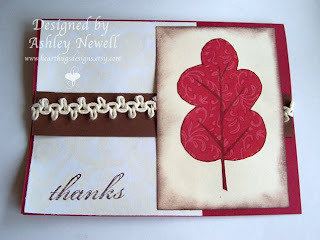 I love that first one with the fun ribbon and cool red tree!!! Gorgeous!! Ohhh do I LOVE that cupcake card witht he fabulous dp and embellies!!!! !